CAPE CANAVERAL, Florida - Researchers with the University of Central Florida Marine Turtle Research Group discovered a rare two-headed Loggerhead sea turtle while conducting sea turtle nest surveys along Brevard County beaches. The condition is called Dicephalic parapagus, a rare form of partial twinning where there are two heads side by side on one torso. Although rare, two-headed sea turtles are not unheard of. 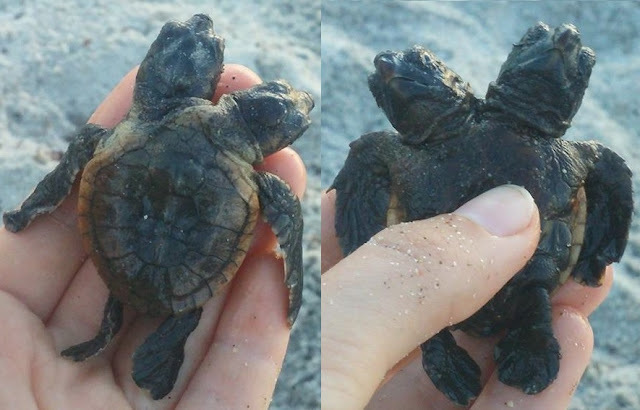 In 2012, a two-headed sea turtle hatchling was discovered on Jupiter Island in Broward County, Florida. Loggerhead sea turtles typically nest in Florida from April through September. In the United States, 90 percent of all loggerhead nesting occurs in Florida. The majority of the Florida nesting takes place on the east coast of Florida. In fact, in Brevard County there were 23,457 loggerhead nests in 2014. This is not the only rare find made by the UCF Marine Turtle Research Group while conducting sea turtle surveys on Florida's Space Coast. In 2016, the researchers found a rare hybrid sea turtle caused by inter-species mating between a green sea turtle and a loggerhead sea turtle in Port Canaveral, Florida.